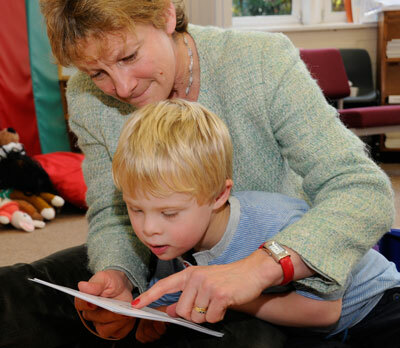 Early intervention has been advocated for children with Down syndrome since the 1970s as a means to improving development during the critical early years. Yet, there is a disturbing lack of research assessing the benefits of specific interventions. Some available studies suggest that different interventions can result in substantially different outcomes, indicating that further research is urgently needed. Early intervention programmes for children with Down syndrome began in the 1970s with the primary aim of improving or accelerating children's development but we still have little data on their effectiveness. Some studies have reported benefits for children with Down syndrome and for their families, but most are methodologically limited (small numbers, lack of control groups, only evaluating one type of intervention approach, measuring different outcomes). Therefore, while there is a general consensus that early intervention can be beneficial, we still have little data on the most effective approaches. Professionals differ in the approaches they recommend which can be confusing for families and for those responsible for delivering and funding services. There are two important facets to Responsive Teaching. One is a focus on training parents in responsive rather than directive strategies when playing with and teaching their children. The other is a focus on helping children develop pivotal behaviours which equip them to be more successful and independent learners. Examples of child pivotal behaviours are curiosity/exploration, joint attention, imitation, initiation, attention, persistence and cooperation. This contrasts with a focus on teaching to achieve specific goal behaviours such as building a tower of bricks, posting shapes, naming colours or completing a puzzle. Further information about the Responsive Teaching approach and curriculum is available on the Responsive Teaching website. In one recent study in Turkey, Responsive Teaching was compared with the standard early intervention children were receiving over a 6 month period. Fifteen preschool children with Down syndrome between 2 and 6 years of age and their mothers took part and were randomised into 2 groups. One group continued with their standard early intervention service which was attending a local special education rehabilitation centre 2 days each week for group intervention and two hours of individual intervention focussed on teaching IEP goals. Parents could observe but did not participate in their child's intervention. The other group also continued with this service. In addition, they received a 1.5-2.0 hour individual parent-child Responsive Teaching session weekly for 6 months. The study measured the children's developmental progress and any changes their interactive engagement. It also evaluated changes in the mother's style of interaction with their children. The mothers in the Responsive Teaching group increased their responsiveness and decreased their directiveness while the mothers in the comparison group did not change. The children in the Responsive Teaching group made significantly greater increases in their interactive engagement and became more active participants than the children in the comparison group and this was correlated with their mother's level of responsiveness. The children in the Responsive Teaching group made significantly greater progress in language and social development. Children in the Responsive Teaching group improved their developmental quotients by an average of 47% compared to 7% for children in the comparison group. Although a small study, the findings indicate that teaching parents to interact with their children in the Responsive Teaching way can have a very positive impact on their children's development. The authors suggest that their findings question the need for structured and direct teaching approaches for children with Down syndrome. However, their study provides no evidence to support this conclusion. To answer this question, a study needs to directly compare Responsive Teaching and direct instruction approaches. Both may be beneficial depending on the educational aims of an intervention. Parents may need to be responsive and directive depending on the specific needs of their child at different times and in different learning situations. Next week, we will continue to see how educational research is informing early intervention - reviewing the evidence for the effectiveness of direct behavioural approaches. 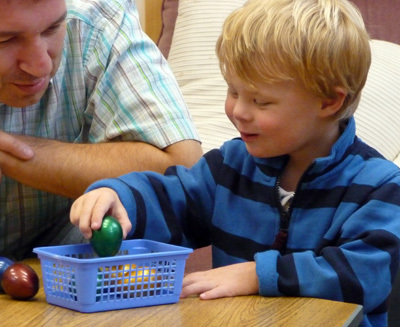 Research examining early interventions is helping parents and practitioners to better support the early development of children with Down syndrome. Research evaluating Responsive Teaching has drawn attention to the importance of pivotal behaviours - helping children to learn how to learn. It has clearly identified the importance of working with parents to maximise the benefits of early interventions and the impact that parent behaviours have on children's progress. Mahoney, G. (2007) Cognitive rehabilitation. In Rondal, J. Therapies and Rehabilitation in Down syndrome. Pp 90-106. John Wiley & Sons Ltd.
Karaaslan, O. & Mahoney, G. (2013) Effectiveness of responsive teaching with children with Down syndrome. Intellectual and Developmental Disabilities , 51. 458-469.